KABUL, Afghanistan (AP) — The International Committee of the Red Cross warned on Thursday that security was deteriorating across Afghanistan as militants flood the battlefield and conduct attacks in what could be the most defining spring fighting season of the nearly 12-year-old war. Gherardo Pontrandolfi, head of the ICRC delegation in Kabul, also urged the warring parties to prevent the deaths of civilians, who have become increasingly caught in the crossfire. "Spring is a good season of the year usually. But unfortunately it has a negative connotation with the resumption of the fighting," he said. "Spring and summer will be very difficult for civilians especially in the months ahead. The civilian population is bearing the brunt of this conflict." So far, April has been the deadliest month of this year. According to an Associated Press tally, 186 people — including civilians, security forces and foreign troops — have been killed in violence around the nation. More than 150 insurgents have also died, according to the tally. 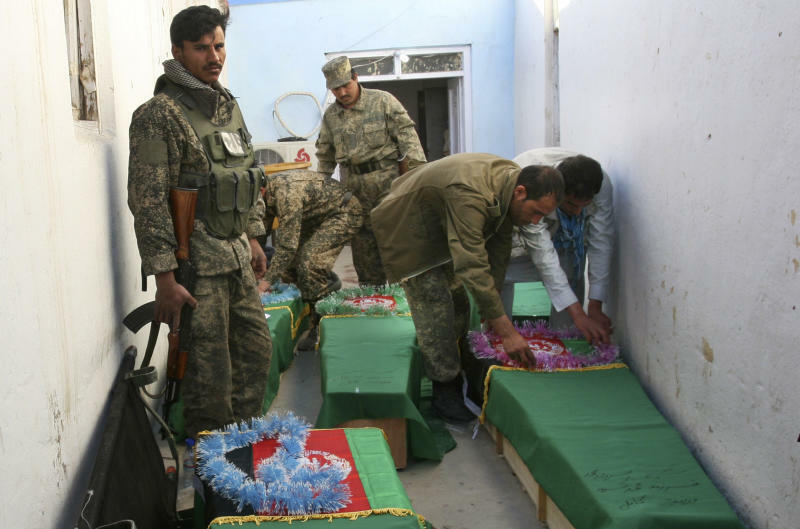 The latest deaths came in southern Helmand province when insurgents shot and killed four laborers building a checkpoint for the Afghan army, said provincial spokesman Umar Zawaq. The Taliban have pledged to target anyone working for the government or the U.S.-led coalition. Pontrandolfi said the Afghan Red Crescent had temporarily stopped humanitarian operations in northern Jawzjan province after unknown gunmen ambushed a medical van on Wednesday and killed two staff members of the local organization. Two other Red Crescent staff members were wounded in the attack. "This is a tragedy, not only for the families of the deceased, but for all those needing medical attention, because now units like these might find it even more difficult to work in certain parts of the country," he said. He added that the security situation has been made worse by a multitude of insurgent and criminal groups now operating around the country, a sign that the mainstream insurgent groups, such as the Taliban, might be fracturing. The Taliban usually allow the ICRC and affiliated groups, such the Red Crescent, to operate in areas they control. "What we see is a proliferation and fragmentation of armed actors," Pontrandolfi said. "Fighting, roadblocks, roadside bombs and a general lack of security prevent medics and humanitarian aid from reaching the sick and wounded — just when they need it most." The Taliban are stepping up their attacks this spring, analysts say, as they try to position themselves for power ahead of national elections next year and the planned withdrawal of most U.S. and other foreign combat troops by the end of 2014. The persistent violence has undermined confidence in the ability of President Hamid Karzai's forces to take over the country's security.